The latest episode of Channel 4’s SAS: Who Dares Wins shows one of the first female contestants, 29-year-old midwife Louise Gabbitas, competing in a boxing match against a man. The episode shows Louise, from Cornwall, opting to fight a male contestant, 27-year-old student Nathaniel, rather than take on another woman. During the fight, Louise can be seen being hit in the face multiple times by Nathaniel before falling to the ground, bruised and in tears, but with her dignity intact. After her defeat, chief instructor and ex special forces soldier Ant Middleton warned the recruits, ‘The enemy doesn’t care what gender, race or religion you are’. I was trying to not go too aggressive. It was the hardest thing to do. It’s a head f*ck. I’m not crying because you hurt me. I’m fine. I am stronger than some men that I know, physically and mentally. 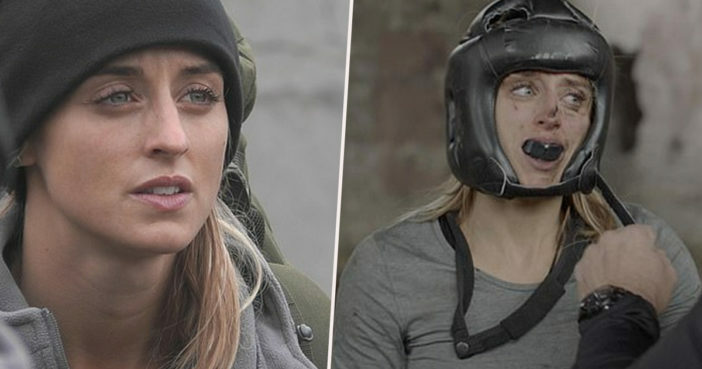 The Channel 4 show puts contestants through gruelling SAS style training, with Louise’s participation marking the first time women have been allowed to compete on the show. This change is on account of the Ministry of Defence’s recent decision to let women apply to join frontline troops and the SAS. Participants were put through their paces during an intense eleven days in the Andes, enduring harsh wintery conditions, with no special treatment offered to anyone. It doesn’t matter if you’re male or female, you need to prove yourself to me. You come on my course and enter my world, I don’t care who you are or where you’re from, you’re a number until you prove yourself otherwise. Watching our @loulaf5 on #whodareswins getting tough! Speaking with Good Morning Britain about her time on the show, Louise described it as being ‘the hardest thing I have ever, ever experienced’. I have seen women do tough things. The hardest physical bodily thing they’ve had to endure, that a woman can go through. I just channelled that strength. I think sometimes yes I do agree with you on that. How biologically yes, men are usually physically stronger than women. However there are stronger women out there. I do love #SASWhoDaresWins #whodareswins but I'm a bit annoyed that it's focussing on the women. I've no clue who most of the blokes are! From the start, we were made aware that we would be treated as equals to the men and that there would be no changes, allowances or exceptions for any of us. Boxing is a regular task featured in each series so I knew it would come up. I was so physically and mentally drained I didn’t want to fight ANYONE, Male or female. We were all friends by this point. Gender was irrelevant. However, I had to do it and it was just another task to me. I would have been disappointed if Nathaniel had held back. The task was about being equal and he completed the task as he should have. I’m thankful for how things turned out. It taught me more about myself. Losing isn’t ideal for someone so competitive, but it proved I am more resilient than I thought I could be. Nathaniel and I have a good relationship. We’ve discussed the situation at length and I understand I put him in a difficult position. I think how he’s handled it is commendable. SAS: Who Dares Wins is currently being aired Sundays at 9pm on Channel 4.